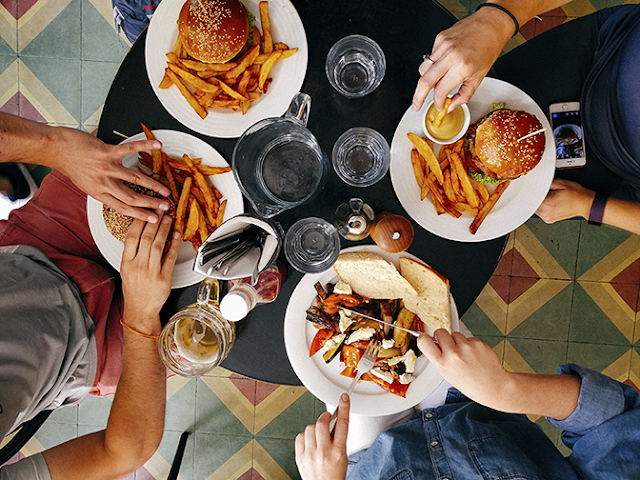 Marketing is important for your restaurant business, regardless of whether your business is small, growing, or large. In your ad spend you'll have integrated into your strategy a variety of channels in your mix, but one that is often overlooked is SMS campaigns. SMS campaigns are extremely targeted. Think of it as an email newsletter, but any notice or information you communicate out to your customer group goes direct to their phones as long as there is a phone line. Just a note, if you're in Malaysia the penetration rates for mobile phones is at an all time high, 144.8% (Malaysian Digital Association, 2016). So for those who have read thus far, here's the gist of it. Your restaurant needs customers to be reminded that you have special offers catered to their needs, what better way to inform them then to give them a reminder that they'll be sure to notice. Here is a case example of Subway the fastest growing food franchise to learn how we can apply SMS Marketing to your restaurant business in Malaysia. 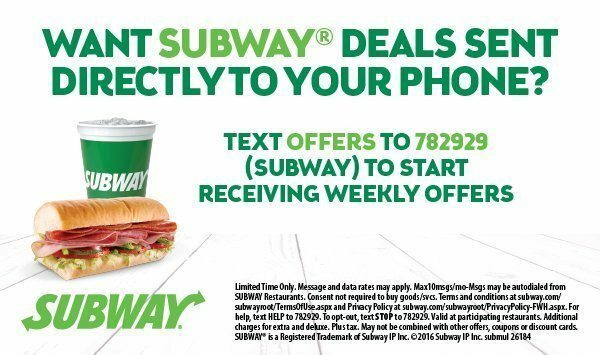 Subway announces to their customers that they can get deals sent directly to their phones. This is followed by campaign graphics that introduce the benefits of signing up to be on Subway's list. Not pictured in the screenshot above is Subway’s abbreviated text messaging terms & conditions, which are as follows: Msg&data rates may apply. Max 10 msgs/mo. Msgs may be auto dialed. Consent not required to buy goods/svcs. Only available for smartphones with a data plan. For help, text HELP to 782929. To opt-out, text STOP to 782929. To see Subway’s full text message terms & conditions, click here. 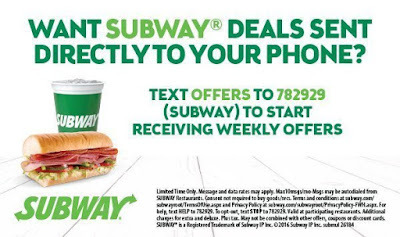 If you prefer to opt-in on your mobile phone to receive Subway weekly text message offers, and receive a free 6-inch subway sandwich, text “OFFERS” to Subway’s dedicated vanity short code – 78292. Did you know that Subway’s vanity short code 78292, spells out “SUBWAY” on a mobile phone’s dialpad? It’s true, try it on your own mobile phone. This is added branding for your restaurant. After submitting your mobile phone number and zip code to receive Subway text message offers, you’ll be redirected to the following page. This page tells you that to start receiving Subway text message offers, you first need to reply to the confirmation text message sent to your mobile phone from their SMS short code 78292. As you can see from the text message below from Subway’s SMS short code 78292, Subway requires you to reply “Y” to confirm that you want to opt-in to receive Subway’s weekly text message offers. Why does Subway require you to reply “Y” via text message, after you enter your mobile phone number into their web form? Not only is this required by the MCMC Malaysia, it protects Subway from sending text message spam. How does it protect Subway from sending text message spam? Here's a scenario, what if in Subway’s web form I accidentally typed in (206) 334-4011, when my actual mobile phone number is (206) 334-4012. 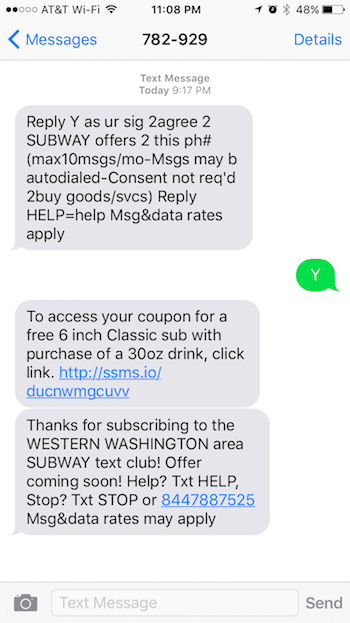 If Subway automatically opted-in the mobile phone number (206) 334-4011, without requiring them to reply “Y”, every text message offer sent to that mobile phone number from Subway would be considered text message spam. That’s why it’s critical that before you opt-in a customer’s mobile phone number, you confirm with them that it is in fact their mobile phone number, and they want to receive your text message offers. When you reply to Subway’s opt-in confirmation text message with “Y”, you receive two text messages in return. 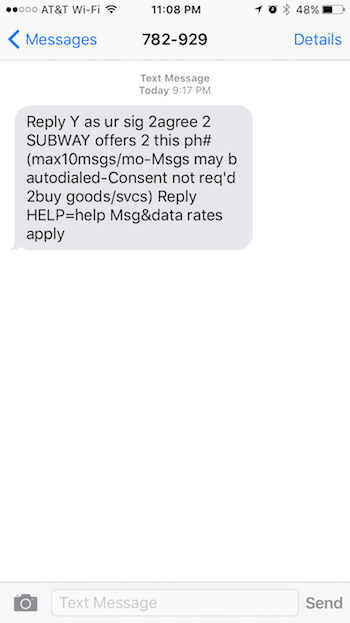 The first text message you receive is the coupon for your free 6-inch subway sandwich, and the second text message is welcoming you to the text message campaign. As you can see from the text message below, the welcome text message from Subway is customized based on the subscriber’s zip code. To redeem your coupon for the Subway 6-inch sandwich, you have to click on the link. When you click on the link, you’re taken to the following mobile website, where you can redeem the mobile coupon. It’s worth noting that below the “REDEEM” button, Subway instructs you to only press the redeem button during the purchase process in the presence of the cashier. You’ll see why Subway tells you this in the next mobile screenshot. So after you’ve clicked the “REDEEM” button, you’re presented with the following pop-up on the mobile website. Subway warns you that the coupon you’re about to access will expire within 5 minutes, so it’s best to be at the cash register at your local Subway before clicking “CONFIRM”. Once you do click the “CONFIRM” button, you’re present with your subway coupon, as you can see below. You’ll notice that there’s a 5-minute timer on the Subway coupon, which expires the coupon after it runs out of time. It’s also interesting to note that the coupon specifically tells customers that if the timer hand is not moving, the offer is not valid. Why? This is to prevent you from taking a photo of the mobile coupon and trying to redeem it. In a photo, the timer hand would not being moving. What does it look like when the Subway’s mobile coupon is expired? See below. Why does Subway do this with their mobile coupons? The reason is to prevent mobile coupon fraud. In mobile marketing, coupon code fraud is when a coupon specifically for new mobile subscribers is used by customers that never opted into the mobile marketing campaign, or used by the same customer multiple times. To prevent mobile coupon code fraud, Brands like Subway will limit the usage of each mobile coupon, either by using unique one-time usage coupon codes for each mobile subscriber, or in the case of Subway, they’ll limit the time that the mobile coupon is visible to the customer. One of the best parts about Subway’s text messaging campaign is that they’re advertising it everywhere, including in a commercial! Below are some of the examples of Subway advertising their text messaging campaign to customers. If you're interested to run SMS campaigns like Subway for your restaurant find out more here.